A remake of the unauthorised 1922 Dracula adaptation Nosferatu. It’s probably fair to say that the marketing department at 20th Century Fox had other things on its mind when Werner Herzog’s remarkable 1979 remake of F.W.Murnau’s 1922 classic Nosferatu – Eine Symphonie des Grauens landed on their desks. After all, it had another horror movie on its books that year: Ridley Scott’s masterful Alien. 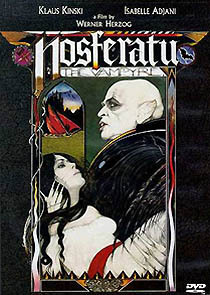 It was perhaps understandable that Nosferatu – Phantom Der Nacht (retitled Nosferatu The Vampyre for English-speaking territories) failed to make much of an impression on American audiences, and it comes as no surprise that the film has languished, generally unappreciated and unloved, ever since. A mid-90s laserdisc version from The Roan Group helped to restore the film’s fortunes, and the good work has been perpetuated with an equivalent DVD version from Anchor Bay. Hopefully the DVD will make it even more accessible to a wider audience. The movie was made with a crew that you could fit in the back of a minibus, for less than a million dollars. A Franco-German co-production, the film brought together an eclectic international cast. Adjani is suitably desirable and waif-like as Lucy Harker, whose luminance attracts the gruesome Count Dracula, (Kinski, rarely better, emphasizing the character’s pitiful human qualities). Herzog, then aged 35, was already the veteran of eighteen movies. He filmed Nosferatu in authentic mainland European locations - something that Hammer never managed during two decades of making gothic horror! The film was mainly shot in the Dutch city of Delft, which boasts wonderful 13th and 15th century churches. However, following the citizens’ objections to the filmmakers releasing thousands of Hungarian “plague” rats, the production was moved to the slightly more accommodating city of Schiedam. Quite frankly Nosferatu is, like Herzog’s other work, an acquired taste. The remake strikes an uneasy balance between modern filmmaking techniques and the stodgy conventions of the silent era. Many contemporary critics seemed confounded by the film’s languid pacing, and ethereal atmosphere. The passage of time has separated Nosferatu from its original context, and it can now be reevaluated on its own terms. At times Herzog’s remake slavishly mimics Murnau’s original. Elsewhere it forges its own path, creating striking imagery that Murnau would surely have envied. Sometimes, as at the film’s climax, Herzog deliberately thwarts the expectations of audiences familiar with the original movie, and this apparent bloody-mindedness is rather irksome. Anchor Bay’s presentation offers all you might hope from such a neglected movie. Or, rather, movies, since there are two versions of the film: a dubbed German version of the film and a truncated English version, which almost entirely eliminates the Renfield character and several scenes set in Van Helsing’s insane asylum. Each version features unique material, as Herzog shot may scenes twice. The short ninety-six minute English version (released here on video and screened by Channel 4 and Bravo) has been restored to the equivalent running time of the German version (107 minutes, give or take a few seconds), and both versions are on Anchor Bay's DVD, offering fans the chance to compare the two. The German version has a Dolby Digital 5.1 sound mix, while the English version is in stereo. The disc looks significantly better than the murky VHS copies, restoring Jorg Schmidt-Reitwein’s dreamily poetic cinematography, presenting the film in its original theatrical ratio of about 1.85:1 in a transfer that's not entirely free from blemishes and digital artefacts. Another sour note, is the lack of 16:9 enhancement. (Anchor Bay has subsquently reissued the film on a two-disc set, offering a new anamorphic transfer for the film and some of the supplements, but little else to make it worthwhile upgrading. This American 2-disc Region 0 set is now the best available version). The disc contains a director’s commentary track, where Herzog is skillfully shepherded by interviewer Norm Hill. There’s a more tangible flavour of Herzog’s manic guerilla-style filming techniques in a mesmerizing thirteen-minute documentary about the making of the film included on the disc, which includes priceless footage of Kinski in the make-up chair. While not quite in the same league as the astonishing Burden of Dreams (the documentary about the tortuous location filming in the Peruvian Amazon of Herzog’s Fitzcarraldo), added to the commentary it does provide a fascinating insight into Herzog’s idiosyncratic thought processes and methods.